Unique moments Photography of Gig Harbor Washington Loves a good surprise. On The way to her reception, The limo driver pretended that that limo was having overheating issues so he pulled over, jumped out of the car,raised the hood and got on the phone. Naturally, the bride started to Freak out a bit. She was 3 miles from the reception venue and everyone was waiting. Then Suddenly, out of no where, a horse and Buggy carriage was rolling out of a row of trees towards the faked broken down limo. The bridal party all chipped in and rented the service with out the bride and groom knowing. The best prank ever. 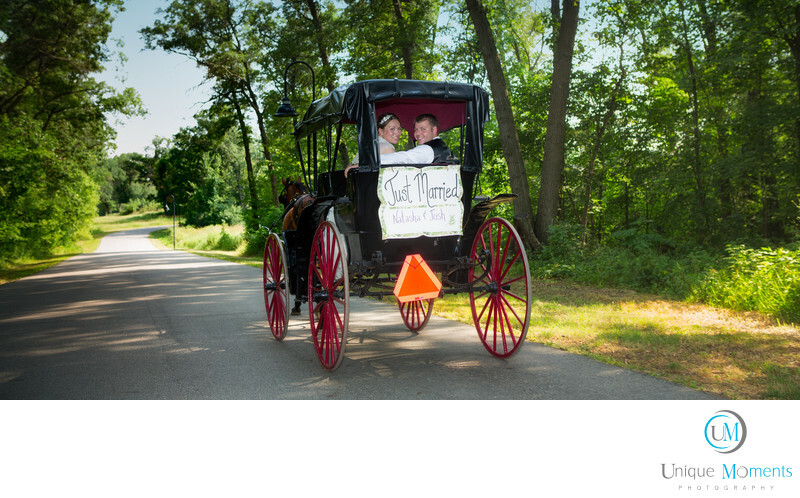 The happy couple jumped into the carriage and completed the trip to the reception venue where all the guests were waiting and lined the drive way. Truly a great moment from a 2012 wedding and it hasn't been topped yet. Bridal party, best man and maids of Honor, let us know is your going to pull a prank. They make for great images and they always end up in the albums. This one was special.